Yohannes Gebregeorgis is standing on the left of the donkey bookmobile in his tan hat. Many African countries speak of the importance of developing “a reading culture” as a way of ultimately dealing with issues of poverty and lack of basic human services for most of their populations. Ethiopia is no different. As somewhat of an additional challenge, Ethiopia prides itself on being a traditional society that resists change; after all, it was the only country in Africa to successfully resist colonization apart from the occupation of the country by Italy during World War II. Yohannes has given years of his life, as well as a great deal of his own money, to the dream of spreading the love of reading he acquired as a young man to today’s potential young readers in Ethiopia. 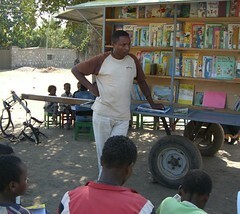 The donkey mobile is not the only method employed to foster literacy. Public community libraries, like ours in Tamworth, do not exist in Ethiopia. Municipal libraries, supported by the government (whether local, state or national) are unknown. In 2003, Ethiopia Reads opened Shola Children’s Library, the country’s first public library for children, which now houses more than 15,000 books. There are now, five years later, five libraries open. 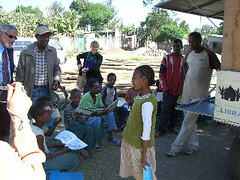 Ethiopia Reads also created and published the first picture book for Ethiopian children in 2002. The book “Silly Mammo,” written by Yohannes Gebregeorgis, was the first bilingual English/Amharic book ever and one of the first children’s books to be published in an Ethiopian language. Although Ethiopian languages (of which there are 80) have been written since 5th c. B.C., and many books have been published in Ethiopian languages, none specifically for children until the last few years. 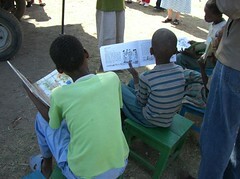 Ethiopia Reads is truly the fruition of one man’s dream – the power of one!